Welcome to Texas Online Hold'em, a website about learning to play online Texas Hold'em featuring everything from beginner basics to advanced strategy tips for players. The goal of our website is simple - to become the most informative authority on Texas Hold'em worldwide by offering our visitors a huge collection of in-depth articles. If your new to the world of poker you'll be happy to hear that Holdem is a simple game to learn - in fact we've written an article on how to play Texas Hold'em & Texas Hold'em rules which you may find useful if you're a beginner & starting to learn the game. If you want to play Hold'em right away, I recommend playing at one of the poker sites listed below which are regarded as some of the top sites right now. Ignition Poker is a new US poker room and offers an online casino, fast software and great support. The poker room accepts USA players and US credit cards and is equipped with a new rewards program. For more information on good sites, check out our Texas Hold'em Sites page which lists some other poker rooms that are high quality including an up to date list of the best online poker usa. If you are looking for more information on playing, you can continue reading or jump straight to the Texas Hold'em Guide which lists all the articles I've written. 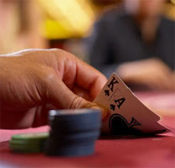 One of the basic fundamentals in beginning to understand the game is getting a feel for poker hand rankings which ultimately determine who wins each round of play. This combined with a thorough knowledge of the major variations of the game such as Limit, Pot-Limit and No-Limit are the first steps that any new player should take in becoming well-versed in Hold'em games. Developing a sound knowledge of each of these games is fundamental in developing a winning strategy as you play over time. As with most things, it's better to learn the correct way to play the first time rather than have to come back only to re-learn certain aspects of the game. Once you've learned the basic flow of Texas Hold'em games, your probably going to want to become versed in some more advanced topics which you will find in our lengthy Texas Hold'em strategy section. There is a huge amount of information to learn strategy wise so be prepared to spend some serious time mastering the ins and outs of psychological and math based principles in the game. As with most things, becoming a savvy poker player will take lots of time and practice and a serious dedication to the game. The landscape of Texas Hold'em has changed drastically over the past ten years and continues to grow in leaps and bounds. What was once a little known game outside of live card rooms and underground clubs has become the most popular variant of poker worldwide and nowadays is played by millions of people on a daily basis. Many industry experts largely attribute this to the success Chris MoneyMaker, an American accountant who parlayed a measly $39 qualifier satellite at PokerStars.com into a multi-million dollar win at the now infamous 2003 World Series of Poker. This awesome story of an average joe playing some cards online and ending up a wealthy superstar was the final ingredient in what would be dubbed the �poker boom� in later years. Below are some of our poker room reviews with the best places to play Texas Hold'em games, each review includes important details on the room. www.PokerStars.com - The largest online poker room in the world. In fact - the poker room is trying to become one of the legal NV poker sites. www.TitanPoker.com - Leading poker room on the iPoker network. www.PKR.com - The world's best 3D poker room with wicked graphics. www.Aced.com - The leading poker site on the Merger Poker Network. www.Bovada.lv - One of the best sites, poker, casino and sportsbook. www.888Poker.com - One of the oldest, very weak competition. Ever since the glory days of the 2003 WSOP, the online poker industry has seen unparalleled growth and development. Currently, there are more than one thousand Texas Holdem sites in the market, some good, some bad and some otherwise indifferent. Using this website, you'll be provided with a solid overview of some of those sites along with tips for improving your game and a ton of other information on Hold'em related topics. One of the sections I am most proud of our this site is the Texas Hold'em Strategy section which was written by some of my friends who are professional poker players. I highly recommend you check it out if you are new to the game or simply want to brush up your knowledge on a number of different strategy topics. My name is John and I've been involved with the online poker community since 2002 when I started out as a casual player in University. Sometime during those hazy days, I started learning how to make websites and realized that I could make some spare change writing about a game that at the time was costing me more money than it was worth. Since then, I've designed, marketed and written for numerous poker and casino related websites, some of which are highly successful websites in their respective niches. I started this website in 2009 as a side project to write about a game I enjoy as well as to hopefully provide new players with some inspiration and education for learning how to play Hold'em. I occasionally play poker games online at Full Tilt Poker and while I don't play as much as I used to, my favourite games include $15/$30 Limit as well as $5/$10 Pot-Limit Omaha which is another exhilarating variation of Texas Hold'em. These days I mostly right articles for this website as well as another site about online casinos that I run with some of my friends. Other than that, I enjoy travelling quite a bit to South America and Europe, as well as to poker industry conferences where I get to hang out with tons of the awesome people I have met in the industry. Thanks for stopping by and I hope that you come back soon to learn more about playing Texas Hold'em.